No sooner had the Michael Matz-trained Union Rags beat Stat in the Saratoga Special that people started comparing the two-year-old colt to Barbaro. Matz entered the splendid son of Dixie Union in the grade 2 stakes off one victory in one start, which, in itself, should speak for his respect of the animal’s abilities. Nevertheless, if there’s doubt, consider what he said in the winner’s circle. “I’m really excited about him,” Matz said, indicating that Union Rags trained exceptionally well in preparation for the race. “Obviously, our main goal is for next year,” he added, when asked the first question always asked of trainers after their horses triumph – “What’s next for him?” The field was small – only five runners. But the colt won on the lead and from the one post convincingly. The track was pea soup. It didn’t faze him. Monday’s crowd was surprisingly large considering the dreary weather. Many fans escaped the backyard to set up camp under the stands or in the entryways to the apron. 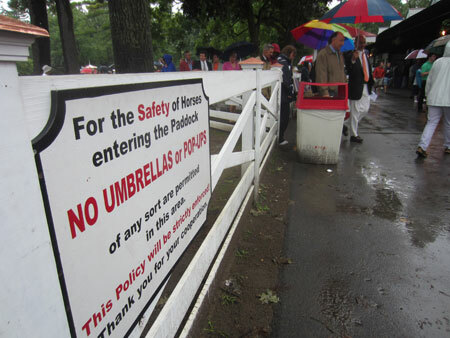 Horse owners and their friends maneuvered about with umbrellas, even in areas where their use is prohibited. As is usually the case on a Monday (Wednesday, Thursday and Friday, too, for that matter), the last three sections of the grandstand looked a bare cupboard. Caption: The sign's not for them. It's for you. The privileged return from the paddock. It began to rain Sunday evening at 9:30 and by Tuesday morning at 9:30 am it was still coming down. 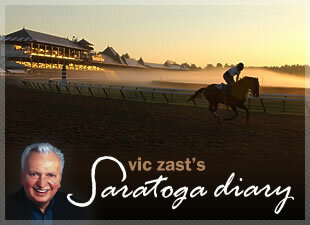 Sun’s expected for Wednesday’s racing, but it’s doubtful the turf courses will be used. They became as dry as a wasteland to the point that dust rose from the heels of the runners like talc from a rosin bag. Maybe now there’ll be give in the ground. 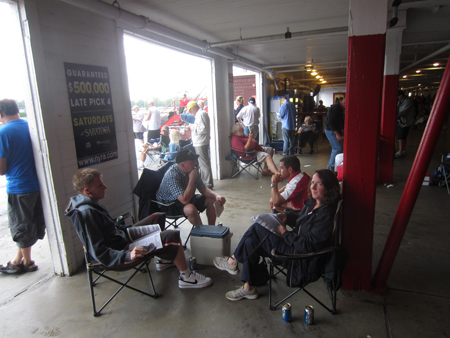 Caption: The rainy day drove backyard picnickers under the grandstand. The conditions for Wednesday’s feature race, the $75,000 Troy Stakes, are written to have the six horses entered compete on grass. We’ll see. By the way, if you’ve not been to Troy, NY, it’s worth the 30-minute trip. Go, at least, for the Dinosaur Bar-B-que. Speaking of food, several jockeys including John Velazquez, Ramon Dominguez and Javier Castellano – the meet’s three leading riders – prepared dishes at the Stadium Café at a fundraiser for the Permanently Disabled Jockeys Fund. Some jockeys served as bartenders and wait staff. The Prevention Council held its fourth annual Dare to Dream gala at the Hall of Springs restaurant. The event honored jockey Robbie Davis. On Tuesday – the dark day – half the people from the grandstand headed north to the outlet malls in Lake George, NY, home to the “World’s Oldest Miniature Golf Course in the United States” and only diving horse.